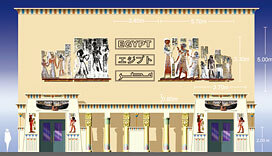 The theme of the Egyptian Pavilion is "Eternal Egypt." As the point of contact for the three continents of Asia, Africa and Europe, Egypt has built a unique national identity through a process of interaction with various civilizations and cultures. From the ages of the ancient pharaohs and their glories to modern Egypt, the exhibition presents a graphical synopsis of the country's culture and history, as well as major tourist attractions. Replica statues of the pharaohs are also on display. The aim of Egypt's participation in the Expo is to deepen the interest and knowledge of visitors about Egypt and its ancient civilization. Visitors who are planning a sightseeing trip to Egypt will have the opportunity to learn more about their destinations, and those who are interested in doing business with Egypt will also have the opportunity to find out more about the country. The Egyptian government encourages business investment from foreign countries, particularly in the high-tech sector. The government's Public Investment Agency provides consultancy services to overseas small and medium-size businesses interested in doing business in Egypt. The pavilion restaurant serves traditional Egyptian food, snacks and beverages. The pavilion store sells antiques, handicrafts and traditional dresses selected from the famous Khan el-Khalili bazaar in Cairo.